Simple drive recovery can cost upwards of $10,000 and success is not guaranteed. 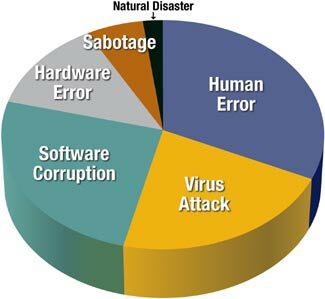 Among other causes, data loss can be attributed to system or human error, adverse environmental conditions and device failure (see below). Human causes of data loss include intentional or accidental deletion or overwriting of files. Virus damage, operating system or application software bugs. Failed upgrades may also cause data loss. Common physical causes of data loss include power loss or power surge, overheating, electrostatic discharge and any kind of physical damage to the storage device or medium.